Let your voice ring at the Big Sing! For the sixth year, Conspirare presents the last Big Sing of the season, in collaboration with Fusebox Festival. 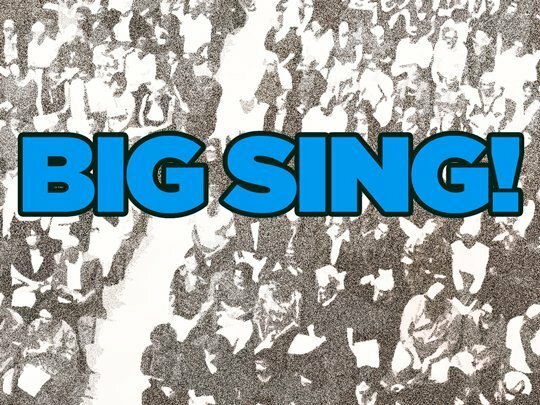 Big Sing is a popular community event where the audience is the choir, all under the direction of Craig Hella Johnson. Participants at the free gathering will lift their voices together to sing music in the Millennium Youth Entertainment Complex. Conspirare’s acclaimed artistic director Craig Hella Johnson, the 2013-14 Texas State Musician, leads each Big Sing gathering in vocal warm-ups and short, melodic songs that can be easily learned. As musical hosts, Conspirare Symphonic Choir members sit among the audience to sing along and provide musical support and encouragement. Song sheets are provided. Musical selections at Big Sings range from popular rounds, spirituals, and Beatles songs to the Hallelujah Chorus from Handel’s Messiah and popular 20th century standards from the Great American Songbook. Johnson hand-picks songs for each Big Sing to delight, thrill, and sometimes challenge the singing audience, always with remarkably beautiful and inspirational results. The Fusebox Big Sing will feature special selections to mark the Fusebox Festival’s tenth anniversary season. The Big Sing is open to everyone, regardless of musical training and experience. Through a fun, no-pressure group singing experience, audience members learn basic vocal technique and sing as one with hundreds of others. The most recent Big Sing in December attracted about 350 participants. Millennium Youth Entertainment Complex Food court open until approximately 8:30pm! The Big Sing is supported by the Rachael & Ben Vaughan Foundation, City of Austin Cultural Arts Division, and Texas Commission on the Arts, as well as by South Texas Money Management, our Season Sustaining Underwriter, and Millennium Youth Entertainment Complex, our Community Partner.